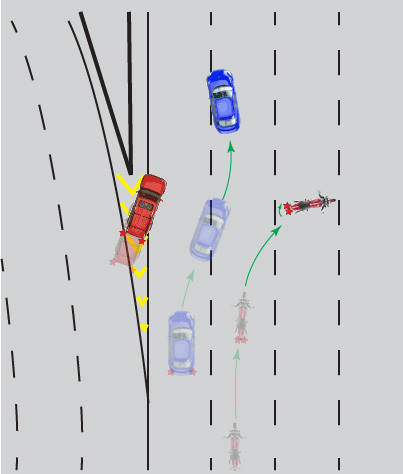 Once upon a time, when the weather was clear and people were out traveling on a freeway in their cars or on their motorcycles, a man in a pickup truck found himself needing to be one lane to his right and almost missing his chance to change lanes. He moved across the gore (the striped area marking a part of the freeway that must not be driven on) riding his brakes - just in case. And, of course, it was the case - a blue car was approaching him in the lane to his right and if he continued moving, there would be a collision. He stopped his truck with only a small part of his front-end encroaching in the fast lane of the freeway. Meanwhile, the driver of the blue car slammed on her brakes to avoid a collision. 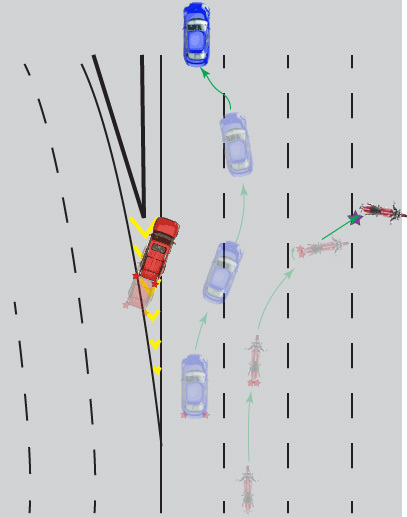 Seeing that she could simply swerve around the stopping truck, the driver of the blue car released her brakes and proceeded to begin a swerving maneuver to the right. At least one second after the car driver had applied her brakes, the rider of a motorcycle, who was behind her in the lane to her right and whom she had just passed, slammed on his brakes in an effort to avoid a collision with the blue car encroaching on his lane. 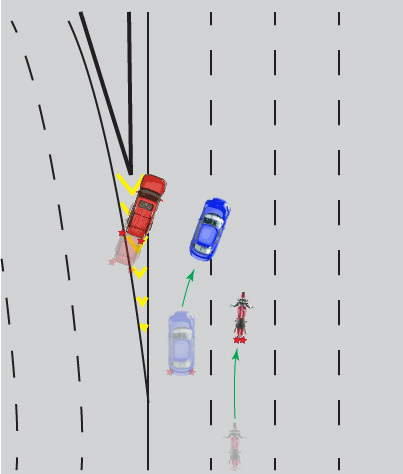 Seeing that he could simply swerve around the stopping car, he began veering to the right to begin that maneuver. 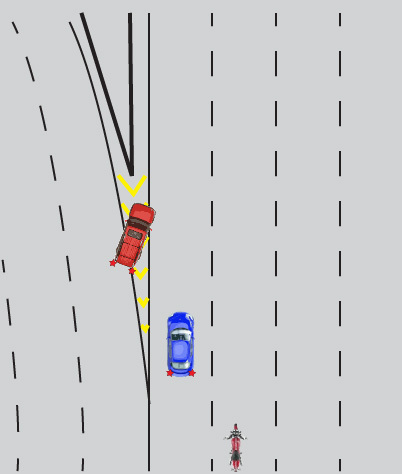 Unlike the car driver, the motorcyclist did not release his brakes before veering to the right. Also unlike the car, the motorcycle was not equipped with ABS. The motorcycle's rear brake had locked, and the rear tire was skidding when he started to move to the right. The rear-end of the motorcycle yawed severely in a clockwise direction. Shortly thereafter the blue car regained her original lane position and proceeded along her way - completely unaware that she had nearly had a collision with the motorcycle. Indeed, she never even knew that the motorcycle was there. The motorcycle, meanwhile, did a lowside immediately followed by a highside. The motorcyclist was ejected from the bike when it hit the ground during the lowside and was not thrown into the air in the subsequent highside. Both the motorcycle and the rider slid to a stop two lanes to the right of where they had started. No vehicle collided with another vehicle, and no other vehicle ran over the rider while he was on the ground. But the motorcyclist died at the scene. The driver of the pickup truck caused this string of incidents to occur. He was never identified as he left the scene - possibly unaware of the motorcyclist and his traumatic behavior. The driver of the car was identified (she was followed by another vehicle, told what had happened, and returned to the scene). She was later sued for causing the death of the motorcyclist. That case determined that the driver of the car was NOT responsible for the death of the motorcyclist - he was. It was shown during trial that the motorcyclist had used improper braking, had failed to observe the imminent traffic problem posed by the encroaching pickup truck (the motorcycle's brake lights should have come on at about the same time as those of the blue car), and had attempted to aggressively brake and swerve at the time. It was brought up that the driver of the car should have been aware of the motorcycle that was near her in the right lane. She, however, claimed that she had looked to the right before swerving and saw that there was nothing there. She claimed that if she had been about to swerve to the left, she would of course have checked to see if a faster moving car was approaching her in the left lane, but that since she was traveling faster than traffic to her right, and that she had to make an emergency move, she made that move without bothering to see if a car was approaching her on the right. The jury seemed satisfied with that logic.